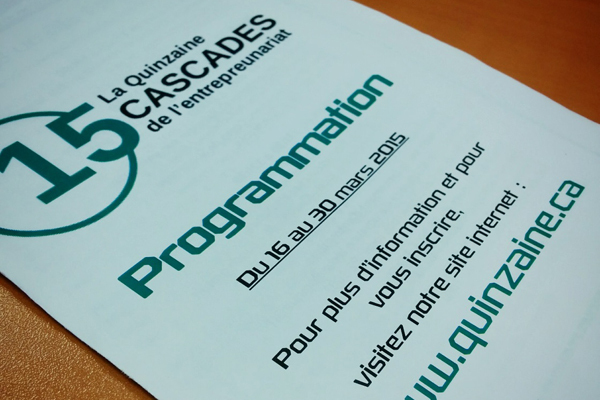 The Quinzaine Cascades de l’Entrepreneuriat is taking place until March 30, 2015. For 13 years now, Cascades has been the proud partner of the University of Sherbrooke to help organize this major event. Each year, the University’s Entrepreneurship Institute, in collaboration with all faculties, holds 15 days of lectures, activities, contests and networking cocktails. Its goal: to promote entrepreneurship and inspire the next generation to start their own businesses! With each edition, the organization manages to renew itself and attract ever more business enthusiasts. Over the last two years, the number of lectures and activities almost doubled! What’s the secret to their success? Since the 2014 edition, coordination was fully placed into students’ hands. Now, the Quinzaine is organized by and for the next generation of entrepreneurs! 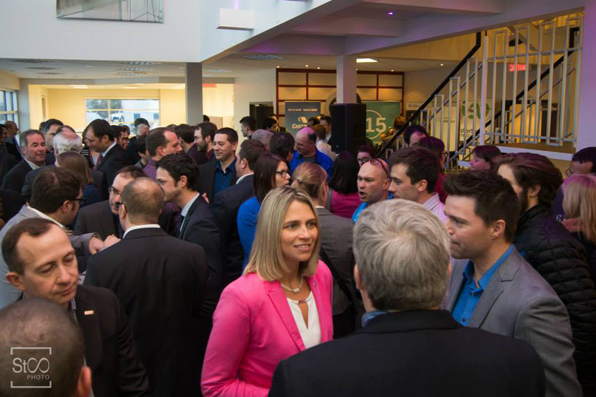 The organizing committee also enjoys assistance from the Accélérateur de création d’entreprises technologiques (ACET), a group that aims to facilitate the creation of innovative and job-creating businesses. Its CEO, Roger Noël, emphasizes the increasing scale of the Quinzaine, which is now outgrowing the campus and building closer ties with the business community. The lectures, which are given almost daily, are held in several different faculties to show that entrepreneurship isn’t just relevant to business administration but rather applies to all areas of study. Check the schedule! David Bureau, now acting as a special advisor to ACET, was the first student, in 2014, to hold the reins of the Quinzaine Cascades. This year, he is contributing to the event in a mentor role. When asked what the Quinzaine brought him, David is quick to list what he gained and learned. The event was a major help for developing his professional network, and it also taught him practical know-how. It was the perfect opportunity to test himself outside of the classroom! David reminds us that even though we often hear about corporate social responsibility, it’s not always easy to see how that involvement is reflected in reality. To him, Cascades was the perfect company to partner with this project, which provides concrete support for local development and rallies the community. In David’s opinion, the Lemaire brothers are an inspiring role model for young entrepreneurs. Through their actions, they’ve shown the accessibility of entrepreneurship. Jessy Blanchette, Communications Coordinator, Donations and Sponsorships at Cascades, said a few words at the press conference launching the Quinzaine, which took place on March 16 at the Leprohon offices. 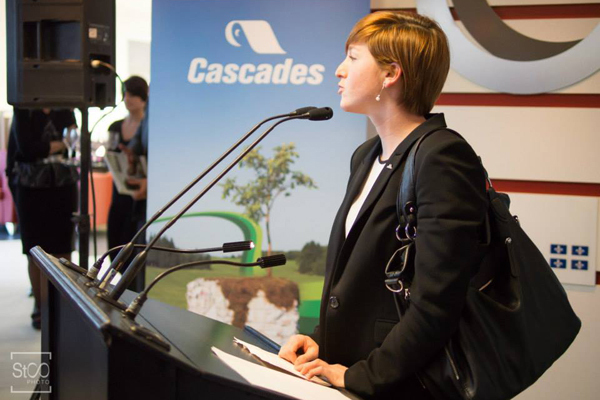 For many years, Cascades has been involved in its community to promote education and entrepreneurship. It’s a cause close to the founders’ hearts: once, the Lemaire brothers themselves were visionary young entrepreneurs who dared to assert their ideas! Even today, every move Cascades makes is guided by entrepreneurial spirit and the will to innovate, and these values are shared with the community through many initiatives. Several members of the organization stressed the major contribution Cascades made to the event. Without it, a Quinzaine of this scale would not have been possible. But the key to the event’s success is the involvement of these young entrepreneurs who are putting time and effort into setting up these 15 themed days. They are the builders of tomorrow, and today, we salute them!